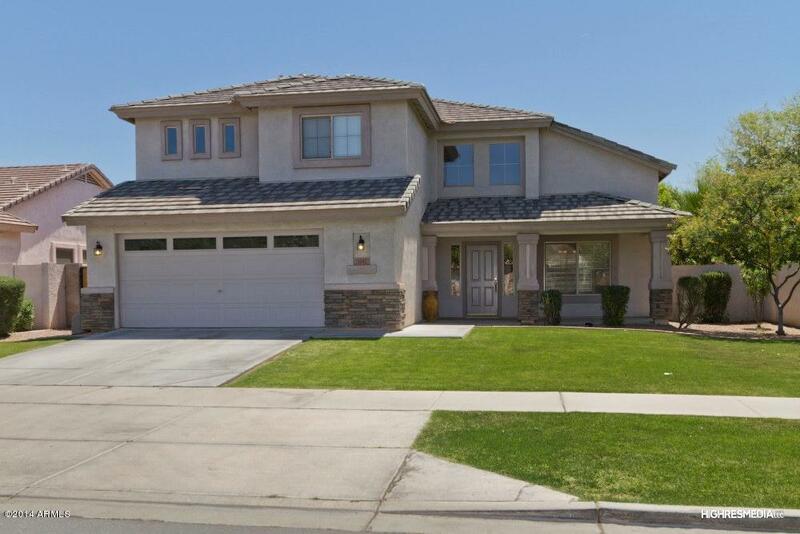 This beautiful two story Southwestern style home with a bit of Midwestern inspiration is located in the heart of Gilbert Arizona’s friendliest neighborhoods: Higley Groves. Homes for growing families are important in Gilbert, and Higley Groves is no exception. These Four large bedrooms will give your family the space to grow. Along with its three full bathrooms this home is idealistic for family life. The streets in Higley Groves are wide with beautiful grassy medians creating a Midwestern feel. This homes’ curb appeal stands out from first pulling into the driveway. When you walk inside of this stunning home you notice a nice sized carpeted formal dining and living room. This opens up into the kitchen which is convenient for when you have company over. As soon as you walk into the kitchen you’ll notice the tile floors and tons of cabinet space. Not only will you have tons of space for cooking, but you’ll also get a kitchen island, true breakfast bar and space for a kitchen table, great for every day family meals. Additionally, you get a perfect view of the backyard so you can keep an eye on your little ones. This kitchen’s upgraded counter tops bring out the gorgeous natural oak cabinets. Upgraded fixtures make you feel like you’re living the resort lifestyle. The double sink in the kitchen makes doing dishes a breeze! Additionally this home has a pantry with a cute frosted glass door. Pantries are great for organization and easy access to food items while cooking. This kitchen is easy to clean all the way down to it’s over-sized tile floor. Can you say counter space!? This kitchen is an entertainer’s dream! Staying cool in Arizona can be rough on your electric bill; good thing this home is equipped with ceiling fans in the bedrooms to help with the energy costs! During winter months enjoy a nice cup of hot coco with the family around the fire place located in the family room. The whole family can gather around to watch a movie and enjoy staying warm in this cozy room. To help stay cool during the hot summer months, each room is equipped with its own ceiling fan. Having a bedroom for each of your kids, is important for their privacy and developmental stages. Having four bedrooms gives each child their own place for learning, and responsibility. Not only do you have all the space you need, but the upstairs bathroom has a double sink along with a private shower, so someone can be showering while another person can be getting ready for the day. At the top of the stairs, double doors lead into the master bedroom and the first thing you see is a giant window that floods the whole room with light. That’s not the best part though; it’s the on-suite bathroom! Walking in there is a separate shower and garden tub along with double sinks makes you think you’re in a four star resort! What more could you ask for? Your kids don’t have to travel far to play or make friends, because right across the street is one of the communities playgrounds! This home is also equipped with a pool. 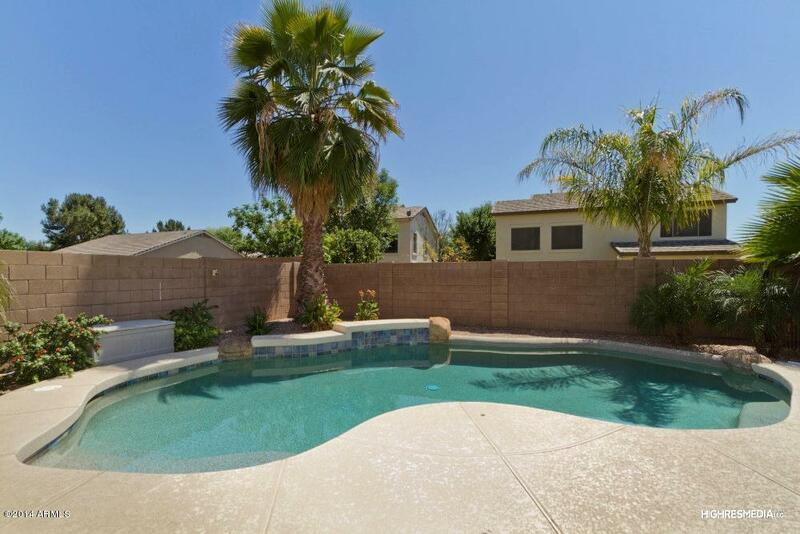 Having a pool with small kids can be dangerous, but this home is equipped with a pool fence around the perimeter pool, giving you peace of mind and so your little ones stay safe while playing in the back. The backyard also provides you with a green patch big enough to have a dog, a play-set or even a trampoline! For more information on this or any other home for sale in Power Ranch please call or text message our office at (480) 269-6060.